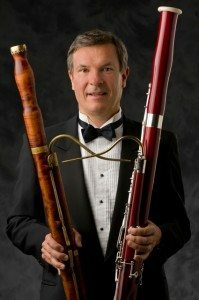 In addition to his teaching responsibilities, Marc Vallon is bassoonist for the Wingra Wind Quintet in residence at the School of Music. A native of France, Vallon studied at the Paris Conservatory, where he earned two Premier Prix–for bassoon studies with Maurice Allard and for chamber music with Maurice Bourgue, Myron Bloom, and Christian Lard. During his conservatory studies, he began playing in various Paris orchestras, performing under many renowned conductors, including Sergiu Celibidache, Leonard Bernstein, Seiji Ozawa, Karl Boehm, and Lorin Maazel. Soon afterward, his interests led him to the numerous smaller Parisian groups specializing in contemporary music. He was a founding member of the Nielsen Quintet in 1975, with which he played hundreds of concerts devoted largely to 20th century repertoire. In addition, he collaborated with the Ensemble Intercontemporain conducted by Pierre Boulez, and took part in the first performance of Boulez’s major work, Répons. At the same time, he earned a degree in philosophy at the Paris-Sorbonne (University of Paris). Mr. Vallon was first bassoonist with the Amsterdam Baroque Orchestra for more than 20 years and performed with other leading early music ensembles such as La Chapelle Royale, Les Arts Florissants, the Orchestra of the Age of Enlightenment, and Tafelmusik. Marc Vallon has taught modern and baroque bassoon at the Paris Conservatory and the Lyon Conservatory, and has given master classes worldwide. His interest in young students led him to create the Concours National du Jeune Bassonist, a nationwide French competition for bassoonists aged 14 and younger. Two of his own compositions, Cantus for solo bassoon and Ricercare for solo cello, have been favorably received by Parisian audiences. Upcoming events: “Breaking Ground,” a concert of music across the centuries. December 1.